Briess Caramel Malt - 80L -1 lb. This caramel malt has a dark toast and mild dry fruit character that makes it best suited for darker, full-bodied styles such as Porters and Dubbels when used at higher percentages (10-15%). Lower amounts (5-10%) are great for adding complexity to an English Bitter or ESB. For more information on various malts and grains, take a look at Byron Burch's Guide to Malts and Grain. 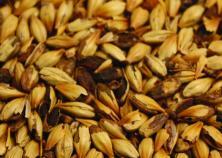 Maltster: Briess Malt & Ingredients Co.